Aren't these cute? I LOVE them! 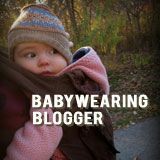 I am making Crayon Rolls (or Crayon Cozies, for holding crayons) for my nieces as Christmas gifts (I'll post pictures of those later), but the younger one (age 2) is a bit young, so I was looking for an alternative to give her. These crayon rounds are the perfect size for her (and Ever). Of course were she still putting things in her mouth, I would have to reconsider (these look almost good enough to eat, LOL! 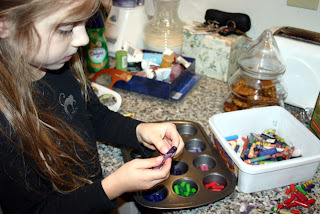 Melting and remaking crayons is pretty easy and the kids really enjoy it too. You can do it any number of ways . 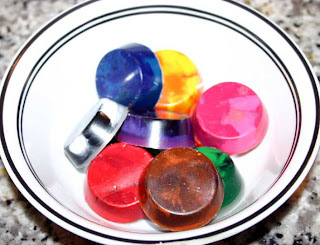 . . melt on the stove and pour into molds, melt and pour into a shallow pan and cut with cookie cutters as it hardens (or letting them sit there till they harden, then pop the crayon out of the cutters) or melting in the oven. I decided to melt them in the oven because I wanted to do multiple colors, and if you melt on the stove and pour into moulds you have to do 1 color at a time (way too time consuming for me). 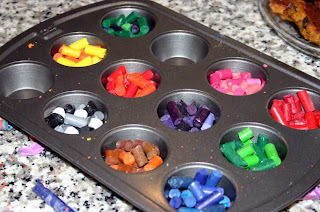 I saw a site online a while back where they recommended using mini muffin tins and even mixing some colors together (can't recall the site off hand). So that is what I decided to do. I can always count on Piper to pitch in and help out. Actually Arah helped me too. I pulled out all my old crayon pieces (I keep all the crayons the kids get when eating out too) and we worked at pulling the paper off of them (soaking them in water sometimes helps the paper come off easier). Then we broke them into like 1/4-1/2 inch pieces and filled the cups to near the top. I alternated colors. I did shades of blue, green, red, pink, purple, brown. And then I mixed yellow and oranges, green and purple and black, grey and white. I set the oven to 250 and it took about 10 min for them to melt. I did a 2nd batch a few days later and with that one I had just finished baking cookies at 340 so I shut the oven off, put the crayons inside (with the door cracked opened) and they melted nicely that way too. After melting I shut the oven off, opened the oven door and didn't touch them till they started to solidify (I didn't want to risk mixing the colors by moving them too much). But it only took a few minutes for them to get hard enough. Then I let them sit on the counter for a while till they hardened all the way and they slid right out of the pan. You can put them in the freezer for a few minutes to speed things up but don't leave them in too long or they can crack (ask me how I know, LOL). As you can see in the top picture, the top edges are a bit pointy so I took a potato peeler to them to round it out more so that they were easier to color with. Since the other kids are getting crayon holders I plan to make little drawstring bags to hold these (after my 2nd batch I ended up with 10 crayons for each kid). Making these was a bit messy, but pretty easy and not super time consuming (especially if you have the kids helping). I will definitely be making more in the future! I am making quite a few things this year and the kids are too. So I'll try to post pictures of everything when I can. Kelley, these are just precious. The kids are gonna love them. You're quite the crafty one! OK, here is what I have learned. Ditch the cheap crayons. For some of these the color went to the bottom and the top was all wax. I had to shave it all off or it wouldn't leave any color on paper if colored with the top edge. I think the cheaper crayons had more wax in them or something and it separated from the color. So sticking with scraps of good name brand crayons would probably produce the best. Most of mine turned out great though. This is a great idea. My older daughter (6 1/2) is helping me out and we are going to gift them to her younger sister & 2 younger cousins. She feels like she is helping out and I'm giving presents that only cost me my time! Great idea. Does it ruin your muffin tin, or does the wax clean off easily? Hmmm, I couldn't remember so I went back and checked . . . yep, it is fine, LOL!! Actually I believe I have made cupcakes with it since. If I recall I think I had to scrub it pretty good, though I would think warming it up would make any residual crayon come off easier. I am thinking about using it to make lotion bars in the next month or so . . . do definitely a useful purchase!! Oh, and one thing I don't think I mentioned before. I realized that a few of my crayons ended up with a thick coating of just wax on top (no color, just wax, like 1/4" of it), which of course, made coloring with it impossible. 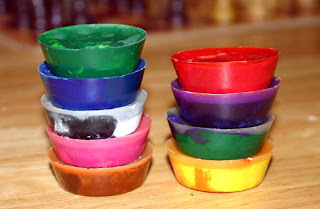 I was using scraps and some were from really cheap crayons, some of which were really cheap ones like you get at restaurants, and I think some of the random scraps must have been way more wax that rose to the top when melted. So when I do it again I am going to stick with better quality crayon scraps, or at least crayons that I know color well. When you color with them you can tell the good crayons from the really crappy ones. It may be true that the wax separation happens with the cheap crayons more, but my observation when I made Xmas crayons in December was that it seemed to happen when I let them stay in the oven longer. It didn't happen when I took the baking pan out of the oven after the crayons had just *barely* melted. Thanks for the tip Elisabeth. I'll make a mental note of that for next time we make them and make sure we take them out asap! For mine, not all of the rounds from a the same batch were waxy (so I don't think it was leaving them in the oven too long, or it should have affected them all?) and I did remember using crappy waxy crayons in a few of them. And when I say waxy I mean the whole top 1/2 of the crayon round was nothing but wax, and the color was only on the bottom 1/2.